David Sigman, of the New Haven American Legion, and Ray Varian, commander of the Mason VFW Post 9926 attended the 9/11 ceremony held at MCCC. The students and staff at MCCC gathered around the school’s flag pole for a ceremony in remembrance of 9/11. 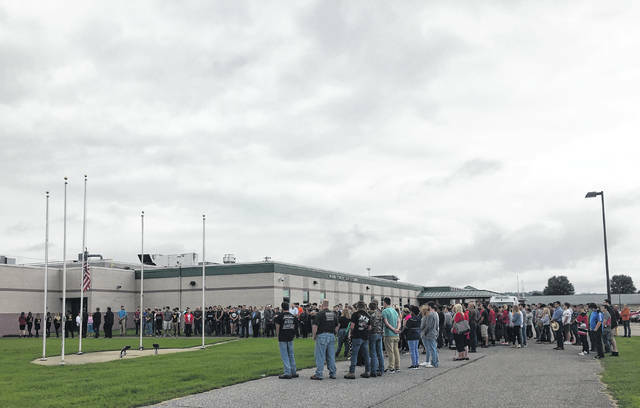 POINT PLEASANT — Under overcast skies, the students and staff at the Mason County Career Center (MCCC) gathered around the flag pole outside the school for a ceremony in observance of 9/11. Skills USA State Office Cierra Beatty raised the flag to half-mast and all at the ceremony recited the Pledge of Allegiance. David Sigman, of the New Haven American Legion, and Ray Varian, commander of the Mason VFW Post 9926, were in attendance and Sigman read a selection entitled “Defend America” from the Navy Office of America. The selection discussed several topics associated with the War on Terror such as reasons to why this specific war is considered unconventional such as this war is being fought on many fronts and the success of this war will be seen at the end result; this war requires financial efforts because terrorists need funding to carry out their “evil deeds;” this war requires diplomacy because terrorists need state sponsors and the U.S. needs international partners; this war needs law enforcement to bring terrorists and those who support them to justice. “Our enemy is physically unlike any we have ever encountered,” the piece stated. The selection went on to explain in the beginning of the war, girls of the Taliban were unable to attend school, but today a generation of young women will be able to get an education. Also, though the terrorist organization Al-Qaeda has not been destroyed, it has been debilitated. The U.S. established a coalition with 70 nations who have a common determination to defeat terror and around the world there are anti-terrorist drag nets. The selection explained the War on Terror is about more than one man or organization and the fight must continue financially, diplomatically, and utilize law enforcement. The U.S. needs to continue work with the coalition to pursue and end destructive and terrorist networks everywhere they are. The selection commented on how the U.S. military must transform to become more lethal, prepared, agile for surprise. “We can predict how we will be threatened, but not necessarily who will threaten us. We need to defend ourselves from these threats no matter where they come from, transformation requires innovation, creative thinking, and risk taking,” the piece stated. The selection explained the most successful defense strategy against terrorism is a good offense and discussed how this war is not only a military imperative, but also an economical one. In a single day’s attack a financial toll of nearly one trillion dollars was put on the U.S.
https://www.mydailysentinel.com/wp-content/uploads/sites/14/2018/09/web1_0912-2-.jpgDavid Sigman, of the New Haven American Legion, and Ray Varian, commander of the Mason VFW Post 9926 attended the 9/11 ceremony held at MCCC. 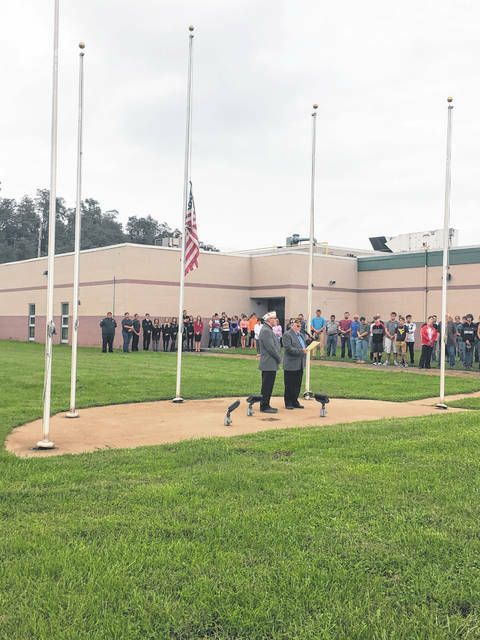 https://www.mydailysentinel.com/wp-content/uploads/sites/14/2018/09/web1_0912.Ceremony.jpgThe students and staff at MCCC gathered around the school’s flag pole for a ceremony in remembrance of 9/11.